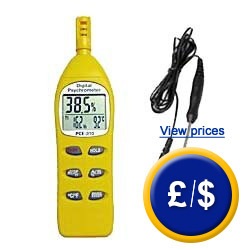 The PCE-310 hygrometer is an exceptional device with a low price. This hygrometer determines climate conditions including temperature and humidity, and also measures surface temperature using an optional external sensor. This hygrometer also includes details such as dew point and wet bulb temperature. One potential use could be to prevent fungus when food is being transported or kept in storage. It is also very helpful in the construction sector. Workers often complain about not having a device available to measure environmental conditions and wall temperature. It is frequently found to be used in the industrial sector and product development. On top of these uses, it can be recalibrated in situ using optional calibration equipment, or can be sent to have a DIN ISO accredited calibration which is recommended to be done annually. Here you will find an overview of the hygrometers we have available to suit your needs. problems in the construction industry. perating conditions -20 to 50°C / 0 to 100% r.h. Examples of use for the PCE-310 hygrometer. 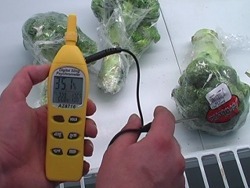 Measuring temperature using the PCE-310 hygrometer and an external sensor. 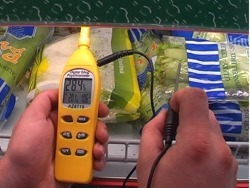 Measuring temperature and humidity of a refrigeration unit in a supermarket.